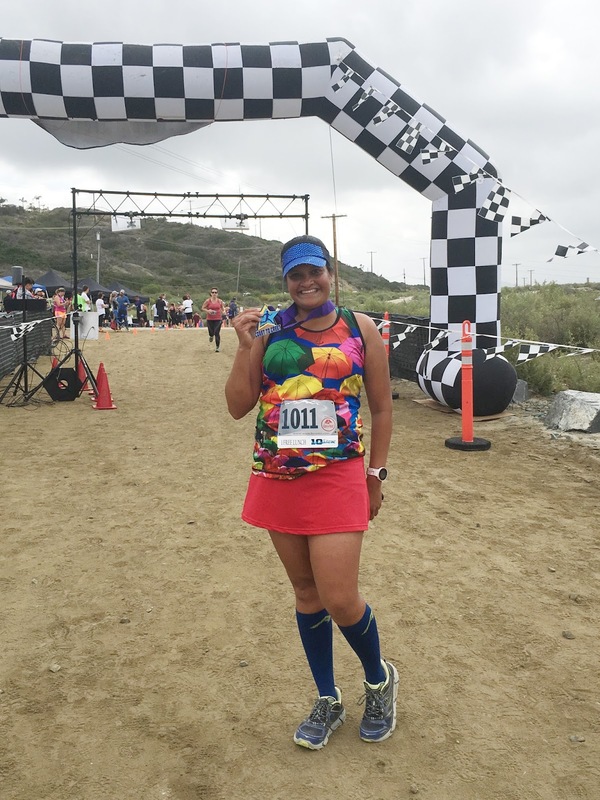 Running with SD Mom: #WeeklyWrap: Trails, Trails and more Trails - Coast to Crest 5 Miler Recap! #WeeklyWrap: Trails, Trails and more Trails - Coast to Crest 5 Miler Recap! Happy Monday Friendly Humans! What a great weekend it has been! I started the weekend with a trail run and ended it with a trail race! And I am not sore. Trail running is good for the knees and the soul! But before we get to that, let's go back to Thursday. Remember when I said the whole SD Family played hooky and went to Legoland? Well before that, I went on a trail run with some of my favorites! My girls met me at 5:45 AM and we ran my favorite trails - Los Penasquitos Canyon. If you live in or are planning on visiting San Diego anytime soon, you must run here. They are gorgeous! The best part of the run was being able to run with my Jamye after so long! On Saturday, I laid low and on Sunday, I ran the Coast to Crest 5 Miler. So much fun because I wore my new Ella singlet with my red Spandits skirt. Or was it because so many of my San Diego Moms Run This Town crew showed up? And the race director? Jeff? Awesome! The race was so well organized, marked and the course was gorgeous! Speaking of the course...it was pretty flat. A couple of mini inclines but that is it. These two awesome ladies ran with me...MaryEllen and Lisa. I totally slowed them down but they were so sweet about it! The miles were well marked. The turn arounds were too! Everywhere you looked, there was beauty! And I finished! 18th in my age group! Haha! In fact, all of us finished! Just in time to see Gerardo win first place OVERALL in the 5 miler! Awesome! He has become like a little brother to me because his big sister Cristina is one of my dearest friends! And you won't quite believe the awesome race swag! Wow! I can't wait for the next Seasick Events trail race - Carmel Valley 5K/10K/15K on September 17. Register or read more about it here. Fun fact: I used to live in Carmel Valley. Have you ever done a trail race? I swear, if it wasn't for the possibility of seeing snakes, I would run trails more than I do! Do you enjoy trail running? What do you love about it? For me, I love easy it is on my body! Thanks for linking up! That Coast to Crest 5 Miler looks like a gorgeous course for sure! Talk about race swag, the races I run here in Ontario, your lucky if you get some honey stingers, and loads of coupons you won't use :( Have a good week! Those coupons are the worst! waste of paper! Looks like a great time had by all and a well dressed group too! So fun to get awesome swag! Haha! We pride ourselves on being well dressed! I love your outfit! The Ella singlet is very pretty. The Coast to Crest sounds like a great race. I've done a few trail 5k races. I worry about my ankles on rough trails so I usually steer clear. If I new the trails were smooth, I'd be all in! Happy Monday, SD. Thanks for linking with us. This trail was perfect! Not rocky at all! Snakes are everywhere on the trails here and I am terrified of them! Beautiful pictures! It looks like you have a fantastic time. I haven't done a trail race, it looks like a great thing to do. It is so much fun and lots less pressure about pace etc! I always run trails, mostly because I hate dodging cars! I've only done one trail race! I highly recommend it. People are much nicer and they have better food! I ran a 5K thru Bok Tower this past weekend, part road and part trail- it was beautiful! I live less than 2 miles from Legoland Florida- great place for kids! Happy Monday! Yay! Hope you are having a great week! I'm doing a trail run Saturday! I saw 2 Ella singlets at my race yesterday! Jealous of your sport bean swag. I can't wait to hear all about your race! Wow! Sounds like you had a very busy, but fun weekend!! I love your running outfit, especially the top :-) Thank you so much for sharing at the Sunday Food & Fitness Link-Up. Have a Great Week!! I love the colorful tank! so fun! Thanks for always sharing your runs with us. I started running again and it is so refreshing. I need to get some good gear. I'm glad to have you as a resource. We took the kids to Los Penasquitos Canyon a couple weeks but didn't make it to the waterfall. Next time for sure. Your runs and that race look like so much fun! Running on the trails AND with a group would be a blast. Your "moms run this town" group is so big! I would love to run Los Penasquitos Canyon some day :) Add it to the bucket list!